It all raises questions about God—Why would an all-good and all-powerful God create a world full of evil and suffering? How can there be a God if suffering and evil exist? 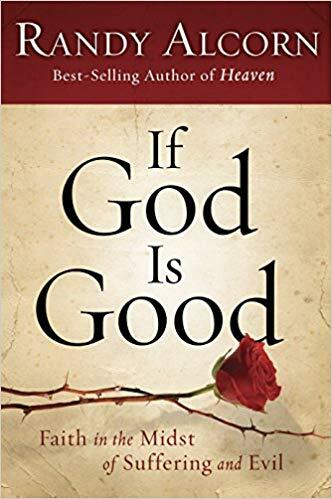 But in this illuminating book, best-selling author Randy Alcorn challenges the logic of disbelief, and brings a fresh, hopeful, and thoroughly biblical insight to the issues these important questions raise. Alcorn offers insights from his conversations with men and women whose lives have been torn apart by suffering, and yet whose faith in God burns brighter than ever. He reveals the big picture of who God is and what God is doing in the world—now and forever. And he shows the beauty of God’s sovereignty—how it ultimately triumphs over suffering and evil in our lives and the world around us. I picked up If God is Good for my Sunday reading. It was very good and taught me a lot about being thankful for what I have. It is a slower read and a big book for that matter. There was a lot of material to process too, which makes it a slower read, at least for me. I recommend this book especially if you are going through a difficult situation right now. Because like this book teaches, everything in the end is for our best and God’s glory. “I picked up If God Is Good for my Sunday reading.” If you don’t mind my asking, do you tend to only read Christian books on Sunday?